Day of the Drum at Krannert Center for the Performing Arts is an almost entirely FREE all-day event celebrating music, especially percussion instruments! The ticketed 7:30 p.m. show is sold out, but everything else is FREE. The performances begin at noon on Saturday. For more information, click here. It’s the first weekend of March, and we might just be optimistic, but it feels like spring might be just around the corner. Speaking of Spring, Spring Break is also just around the corner, and for some of us, that means making Spring Break Camp and Childcare arrangements. While you’re at it, you might want to start planning for Summer Camp, we have a guide for that too. And don’t forget, Friday is “Unofficial”, so you may want to avoid campus. Thanks again to Krannert Center for the Performing Arts, for sponsoring our weekend planner. How much: Tickets are $8 at the door for 12 and under, $10 for all others. All profits from this event will support various community agencies and projects in Champaign County. Why you should go: Champaign-Urbana Junior Woman’s Club is proud to announce their 65th annual production The Little Mermaid! For over 60 years, CUJWC’s Tom Thumb Theatre has been entertaining children with their annual production. Their musicals are short in length, always include audience participation, and are a great way to introduce young kids to theatre. For more family fun at the Orpheum Science Center, click here. When: Saturday, March 2, 10:00 a.m – 1:00 p.m.
Why you should go: It’s one of our favorite annual events, a celebration of reading for pre-kindergarteners through third-graders! Each year, storytellers, musicians, performers, puppeteers, early childhood professionals, rotary members, volunteers, celebrity greeters and community organizations fill Lincoln Square with stories, songs, art, and hands-on literacy activities. The first 1,000 children who attend will receive a free bag and a book of their choice! For more places to celebrate Dr. Seuss, click here. When: Saturday, March 2, 12:00 -5:30 p.m.
How much: The only ticketed performance of the day that is NOT free is the 7:30 p.m. Sold Out Kodo show. All others are free and open to the public! Why you should go: Celebrate global drumming traditions, try out different types of percussion instruments, and immerse yourself in many different drumming styles and rhythms. 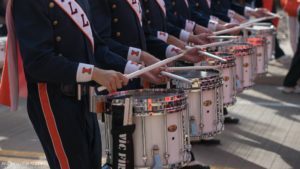 U of I Steel drum band, tap lessons, the Marching Illini drumline and more! For more fun for kids at Krannert Center for the Performing Arts, click here. When: Saturday, March 2, 2:00-4:00 p.m.
Why you should go: Come cheer on the University of Illinois men’s gymnastics team as they welcome Stanford and Minnesota! Held at Huff Hall. Giveaways, celebrate the senior class with a post-meet ceremony, and compete on a Ninja Warrior obstacle course at Huff after the meet. When: Sunday, March 3, 2:00-4:30 p.m.
How much: FREE, Broadway Food Hall will be getting in on the theme with Japanese-inspired food and drink specials. Appropriate for: All ages, Crafts are suitable for young ladies 4-13 years old. Why you should go: Celebrate the traditional Japanese holiday Hinamatsuri, or Girls’ Day, at Japan House! The tea ceremony is full , but there are plenty of other activities to entertain and educate.3:00 p.m., watch a short presentation on the history of Hinamatsuri, followed by a hands-on crafting session of Origami (paper folding), Kokeshi Paper Doll crafting, and Postcard Ink Stamping, as well as Ikebana (flower arranging). When: Sunday, March 3, 2:00 – 3:00 p.m.
Why you should go: Come in costume and celebrate Carnival at the Urbana Free Library! Enjoy beautiful Brazilian music by the Elis Artz Quartet. Dance, make crafts and celebrate with your family at this all ages party. For more ways to Celebrate Mardi Gras with Kids in Champaign-Urbana, click here. Weekend Planner features only a few of the wonderful events happening in our area. For a full list, including an All Breeds Cat Show, please visit our Events Calendar, sponsored by Busey.